Saltwater fish keeping is fun and rewarding for first time aquarists and advanced beginners! Keeping saltwater fish is a wonderful and exciting hobby. Whether you are a beginner and this is your first aquarium or you've kept freshwater tropical fish, you will be amazed at the grace, dignity and beauty of marine fish. But beware, as you expand your knowledge about the fascinating life in our oceans, you may find yourself wanting to know even more! If you are about to start your first saltwater aquarium, you are embarking on a grand adventure. Marine fish are some of the most spectacular aquatic animals, and there is a very diverse and magnificent selection to choose from. The benefits of keeping saltwater fish are many. They are entertaining, relaxing, and make an incredibly beautiful showpiece for your home. Are saltwater aquariums hard to keep?... When the marine hobby was in its infancy, there was a lot to learn about keeping saltwater fish, and so a lot of trial and error. Consequently the idea that keeping saltwater fish is difficult became a stigma attached to the hobby. But just like keeping any animal, when you provide the right environment, food and companions, keeping them is just a matter of being dedicated and responsible. Early hobbyists who began to be successful were often held in awe, but today the information for keeping many species is readily available. What the question really means is, can a beginner successfully keep saltwater fish with a reasonable amount of effort, and the answer is yes. Keeping a saltwater fish tank is about the same as keeping a tropical freshwater fish tank. If you provide the right sized aquarium, good filtration, proper temperature, the right foods, and compatible tank mates, you can keep many marine fish successfully. There are a couple of differences between keeping saltwater and freshwater fish that are easy to understand. Saltwater fish need a lot more water per fish than freshwater species. Saltwater fish are also more sensitive to fluctuations in temperature and water chemistry, so it is more important for marine aquariums to remain stable. Black and Gold Damsel in the wild. This video starts out with a yellow juvenile, then moves on to a dark adult with yellow toward the back of the body. Looks like they are inhabiting a Bird's Nest Coral. They become very mean as they grow to their ultimate 5" size, and need a minimum tank size of 55 gallons due to their need to swim about much more than others in their family. Their longer body and forked tail provide them with the speed they need! A very interesting behavioral display is shown with this small group of juvenile Sergeant Major Damsels. As juveniles they form loose, smaller groups and dart quickly and erratically. They may be cute, but grow up to be nasty! Brief yet good video of adult & kiddies in captivity. This video is very brief, but shows what looks like a parent and several offspring that someone successfully bred in their tank! While it is not suggested to put this many in one tank, this may be the case of family, which may be why the adult is not attacking the young! Typically a pair or one Sergeant Major can be kept in a 75 gallon tank. Video shows a Goldtail Damsel (Chrysiptera parasema) specimen from the Philippines or Indonesia locations. These have only yellow on the back tail and a little into the body. They are small, mellow for a damsel, and easy to take care of. They do spawn in captivity easily, though rearing the young can be quite difficult. Nice view of a juvenile Neon Velvet Damselfish in a peaceful community saltwater aquarium along with some nice coral species. Real nice video showcasing this wonderful beginner saltwater fish. This pretty little fish is also known as the Blue Yellowtail Damselfish and the Goldtail Demoiselle. Goldbelly Damsels in dealers tank. Quick video of a tank full of Goldbelly Damsels. They only grow to 2.8" or 7 cm, and are great alone in a 20 gallon nano or in groups of 4 or 6 individuals in a tank that is 65 to 95 gallons. There are many excellent saltwater fish to choose from for beginners. Some are well suited for the new beginner's aquarium and even more can be kept by more advanced beginners. There are also fish that fit all the parameters of a great beginner fish, but due to size and diet, are best kept individually and make a great show specimen. The list of starter fish in the chart below includes fish that would be comfortable in a tank of 30 gallons. Each fish is further categorized as New Beginner, Advanced Beginner, or Specimen Tank Beginner. Fish for more advanced beginners, those that have kept tropical freshwater fish or are prepared to care for more complex fish, are specimens that also quite hardy, but may have more specialized requirements for diet and habitat. Besides the peaceful fish suggested for new beginners, fish included here also include semi-aggressive fish, and aggressive fish. There are some really great beginner fish for a specimen tank. These are generally large hardy species, requiring the entire tank for their space and water volume needs, and/or will generally eat smaller fish. These species that can be either peaceful, semi-aggressive, or aggressive. Saltwater fish that are great for beginners and small tanks are damsels including the chromis. Others include certain clownfish, cardinalfish, blennies, gobies, hawkfish, firefish, basslets, grammas, dottybacks, pseudochromis, along with a few others. An overview of the general characteristics of the groups, by the types of fish, is summarized here. The charts below separate individual species by temperament, being either peaceful, semi-aggressive, and aggressive. All of these saltwater aquarium fish in have proven to be hardy, undemanding, and well suited for the beginning hobbyist. These fish are often suggested as the best beginner fish for a marine tank. They are small, very hardy, inexpensive, and not picky eaters. They also come in incredible colors and color patterns. They are the best choice to break in a marine tank. They can become permanent residents if you want more aggressive fish, but if you want to keep more peaceful fish, then you will want to take them back to the pet store. One or two will get along, but more can lead to fighting. The most peaceful like the Blue Green Chromis, Talbot's Demoiselle, Blue Damsel and Yellow Tailed Damsel are not as aggressive as others, but the Three Striped and Domino Damsels are very aggressive. These freshwater fish can be acclimated to a marine tank and be used to break the tank in. Once the aquarium is cycled they can be kept with peaceful marine fish or they can be re-acclimated back to freshwater. Acclimate them by putting them in a small container (or the bag they came in) and then add very small amounts of saltwater (a few drips at a time) for about 6 to 8 hours, slowly raising the salinity to the level of your marine tank. Then transfer them. Clownfish are from the same family as damselfish and are also fairly small and hardy, not too expensive, and are not picky eaters. Though they are very territorial, they are generally not aggressive toward other fish. Some can be aggressive however, particularly Tomato Clown fish. They are typically seen with anemones in nature, but don’t need an anemone in the aquarium. Keeping an anemone in the aquarium adds more complexity than a fish only tank, so anemones are not suggested for a beginner tank. 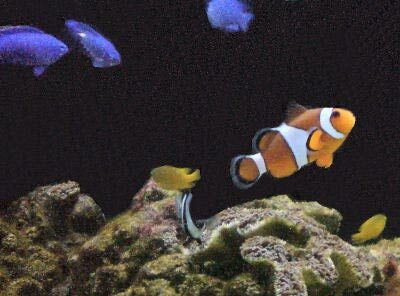 Clownfish that are captive bred are usually hardier, though more expensive. These small fish that are fairly hardy, generally get along with other fish, and can help control algae. They need plenty of hiding places but are great feeders, and will eat most anything you offer. Some have a lot of personality, and although their color patterns vary between species, some are quite striking. There are some really great beginner fish that are very unusual in body shape and color pattern. Some favorite varieties include the Banggai Cardinalfish and Pajama Cardinalfish. They are hardy, peaceful fish and fun to watch. These fish are semi-aggressive. There are a couple that are only 4-5” and can be kept with similar temperament fish, but they can be aggressive to invertebrates. These are pretty little fish that are peaceful. They do well with other peaceful tank mates. There is a common story about these fish that they are like the “canary in a coal mine”. It is said that if your water quality is diminishing, they will be the first to let you know. If everything’s fine, their dorsal fin will be erect, but if not it will be laid flat against their back. This may not be absolutely true, as other stress conditions like being harassed by another fish may also be the culprit, but it is fun to watch them as your tank's barometer. These fish are active and either semi-aggressive or aggressive. For the beginner tank there are some small colorful species that reach about 3”. These are not peaceful fish, but there are several that are semi-aggressive and one that is aggressive. They can be kept with similar temperament fish, but can be aggressive with invertebrates. Wrasses are usually categorized for fish-only tanks and are semi-aggressive and active. There are a couple small fellows that are peaceful, only reach between 3" to 4 1/2", and can be candidates for a beginner tank. Most are larger and prefer live foods. Shrimp display fascinating behaviors on their own and as they interact with fish. They can make wonderful additions to the right saltwater aquarium. They are relatively hardy, but like most invertebrates they are susceptible to high nitrate levels and you must remove them when treating the tank with copper, as it is lethal to invertebrates. Crabs are another great invertebrate choice for a beginner's saltwater tank that are quite hardy. There are a number of different types you can choose from including hermit crabs, arrow crabs, and porcelain crabs. You must remove them when treating the tank with copper, as it is lethal to them. Both semi-aggressive fish and aggressive fish, though quite hardy, can harrass peaceful fish intolerably. These fish are better for advanced beginners who will design their fish selection with more understanding of each individual fish. Knowing what types territories these fish need, what their diets requirements are, and the types of fish they are likely to pick on and why, these things help in choosing compatible tank mates. Each of the different types of saltwater fish you'll find in the hobby is adapted to life in the ocean in different ways. Despite the vast expanse of the oceans, most of these fish stay within a particular region. These fish are small ocean inhabitants, and often a food source for much larger marine animals. Most of the species live among reefs, rocks, and rubble strewn sandy areas in the wild. Their natural homes provide nooks and crannies where they can quickly take refuge if the need arises. These areas also support many other types of plant and animal life that are rich, nutritious foods sources for the fish. Some fish will swim about fairly large areas, while others stay very close to the same coral head or rocky outcropping their entire lives. There is competition in their natural habitat for both food and protective shelter, and so almost all saltwater fish have some level of aggression. Many will stake out a particular territory as their home and aggressively defend it from intruders. They identify intruders by the body shape and/or color of another fish, as well as by its eating habits. When saltwater fish come into the home aquarium, just like in the wild, they need a habitat that suits them. The aquarium needs to provide a place for protection and refuge and proper food. They also carry their instinctual behaviors with them so need individual space and compatible tank mates. Just like freshwater fish, each marine species has its own needs and requirements. What works for one fish doesn't always work exactly the same way with another. Saltwater aquariums ranges in their complexity depending on which inhabitants you want to keep. Saltwater fish are also are mostly collected from the wild, though more and more species are now being captive bred. To acclimate wild caught fish takes more care and attention than captive raised specimens. No matter what your skill level, to keep saltwater fish successfully requires providing and maintaining a properly set up aquarium. Many beginner saltwater fish are easy keepers in a 30-gallon aquarium, and there are a few that can be kept in a smaller 10 or 20-gallon tank. Once you have your aquarium up and running, take your time in selecting your fish. Start slowly, populate your tank with the correct number of hardy species, introduce peaceful fish first and add the aggressive fish last, and get the hang of maintaining the marine environment. You want to have a successful aquarium, and there is nothing more discouraging than to loose your favorite fish, or a whole tank of fish. You want your fish to be hardy and easy to care for, and avoid inappropriate choices. Doing a bit of research before hand can help eliminate many aquarium problems and heartbreaking experiences. Take some time to look at the different species, and then make a list of those that you are most interested in. Compare your list with the suggested beginner fish, and eliminate those that are not good starter fish. They may be great selections for a future tank, but not so good for the beginner aquarium. Now you need to determine which of those fish to choose. Here are some guidelines for choosing saltwater fish. For a compatible community tank, you need to know how each fish gets along with others. Fish range in temperament from peaceful or semi-aggressive, to highly aggressive. Compatibility between fish of different temperaments is highly variable and dependent on a number of factors. Most often fish with similar temperaments get along well, and can sometimes get along with fish of a slightly different temperament. Aggressive fish can hold their own when kept with other aggressors, but can wreak havoc on peaceful fish. Yet a semi-aggressive fish may be okay with either a more aggressive or a more peaceful fish. Some fish will get along with other similar species, but only if they are a different color or shape. Sometimes a peaceful fish will aggressively go after a fish because of the way it eats. To aid in compatibility start by introducing putting peaceful fish to the aquarium first, then progressively add the semi-aggressive next, and finally the aggressive fish last. The biggest mistake aquarists make is overstocking their tank. Two primary considerations when stocking the aquarium are the relationship between the tank size and the number of fish. When you purchase saltwater fish, they are generally juveniles but will grow to adult size fairly rapidly. The adult size is what matters when determining the number of fish you can put in your tank. The aquarium needs to provide enough space for the fish to stay healthy and be comfortable. So how many fish can you put in your aquarium? A general guideline is 2” of fish for each 10 gallons of water. This is not an exact figure as it can vary depending on the type of fish and the bio-load they place on the system. For example, heavy bodied fish and very active fish can produce more waste, adding more bio-load, while slender fish or passive bottom dwellers are less of a load. Just about every saltwater fish needs to have a place of refuge. In the wild, most live close to corals or rubble with lots of cracks and crevices where they can hang out, or quickly dart to safety. Some will live in burrows in the sand, often at the base of a rock outcropping. In the aquarium they need hiding places and many will claim a particular area to establish as its territory. Your fish will be most comfortable if there is plenty of live rock, coral skeletons, or a combination of the two for them to find safety and feel at home. Saltwater fish in general are more sensitive to fluctuations in temperature and water chemistry than their freshwater counterparts. The suggested beginner saltwater fish are those tend to be the most adaptable. They are hardy fish and the least susceptible to disease. Good beginner fish aren't that picky about what they will eat. This is especially true for the new beginner fish. Advanced beginner fish are also usually easy feeders, but there are some that may want live foods. Others may be piscivorous, a fish eater, or browse on on invertebrates like ornamental shrimps, clams and corals. Beginner specimen tank species are kept singly because they often eat other fish. In general, saltwater fish are more expensive than freshwater fish. This is true even for those that are small, reaching only 2-3" in size. Most of the beginner saltwater fish in the chart below range from $5.00 to $25.00 apiece, with the average being about $10.00 to $15.00 apiece. Some species are even more, with a few being over $100.00. With this type of investment in your pets, you certainly want to choose the best beginner fish for your aquarium. The new beginner saltwater fish are commonly available at fish stores and online. Many of the advanced beginner fish are also quite common, but there are some species that are more sporadically available. It helps to work closely with your fish store. Let them know what you are looking for so that when a particular species is available, they can let you know and obtain it for you. Ok so I have a 90 gallon salt water tank I started with a 30 gallon then moved it up to 90 now I have had several fish and I have a singular clown. My clown fiah is a jerk and beats up any fiah I drop into the tank. I'm going to be trading him in. I want the most colorful fish I can get however I also want them to be hardy ad I have 2 young children ad sone weeks I cant devote the time I need to to the tank. WHAT FISH DO YOU GUYS RECOMEND! This is great! Thank you for this I really appreciate it, everyone on the internet has there own opinion about how to look after your tank and it has been very confusing so thank you so much for this. I have had my tank acclimatised and just added fish, wouldn't have been able to choose without this! yay! they are just so pretty too! I suggest returning the third back to a fish store. You're mated pair will only continue to be territorial and aggressive, not liking any newcomers to their space. want to purchase some non aggressive, easy to take care of saltwater fish that r fun to watch also some lobster shrimp etc.also looking for a larger tank too, mine is only 30 gallons... how many fish can I put in this tank? Will I be able to by a bamboo shark from you?